Until somebody has mastered the breathing tech­nique, it’s definitely easier to swim along just holding on to your breath and not letting it out. The trouble is that sooner or later you have to stop. Some children will look as if they are breathing in and out; they open their mouths when turning their heads to the side and at the right time they roll their heads back into the water. Children are very good actors and imitators, but the teacher with a sharp eye will be able to see if the child really lets the air out. If he is breathing out properly you will see the bubbles. 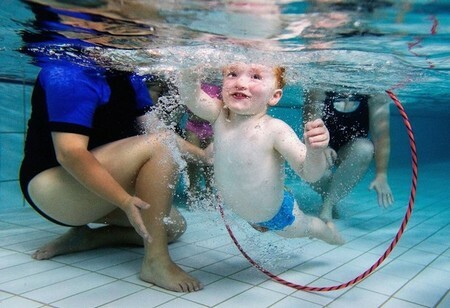 If the pool where you are teaching is not a long one, say thirty or forty feet long, a child might even swim from one end to the other and appear to be breathing properly, when in fact he is not. To correct this particular breathing fault, the teacher should have the child do an exercise called “one-arm breathing.” One arm is placed on the top of a kicking board, leaving the other, the breathing arm, to move alone. Say, “Turn your head, look back when you’re breathing out, take a b-i-i-i-g breath, and as your breathing arm goes into the water, blow a b-i-i-i-g bubble out.” If necessary, have the child do this for a couple of lessons. Alternatively, the child should do a lot of kicking on the kicking board, holding on to it with both hands, lifting the head up but not too far out of the water, taking a big breath, then blowing a bubble into the water. When coming up for air, the child should leave his chin on the water, and when blowing out make sure that his ears are well and truly under the water. If a child is very young and can’t understand what you are saying, place your hand under his mouth as he blows out so he can feel the impact of the air hitting the hand. Praise him when you feel the bub­bles.